What should Narendra Modi aim to achieve in the first 100 days of government? 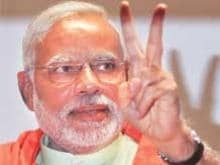 With the BJP having made a spectacular return, all eyes will soon be on how Narendra Modi can turn the economy around and ensure that the benefits of such improvement are all inclusive, among many other things. What should the new Prime Minister's priority be during the first 100 days of government? Do share your views with us.